Since the early 1980s, the name Wolfgang Puck has been associated with some of the nation's top restaurants. 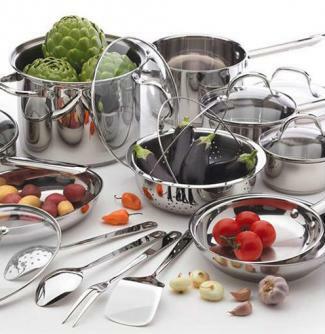 Today, the famed chef is known not just for his restaurants, but also for his fine stainless steel cookware line. This excellent line of cookware is durable, cook-friendly, moderately priced and available in single pieces or multi-piece sets. I have owned and used a complete set of this cookware since 2002 and am happy to share my experiences with you. I am a long-time cooking enthusiast with somewhat of addiction to high-end cookware and kitchen gadgets. In 2002, my house burned and I lost all of my kitchenware, including a set of very expensive professional-grade hard-anodized aluminum cookware that I loved, as well as several open stock pieces from well-known long-time cookware manufacturers. 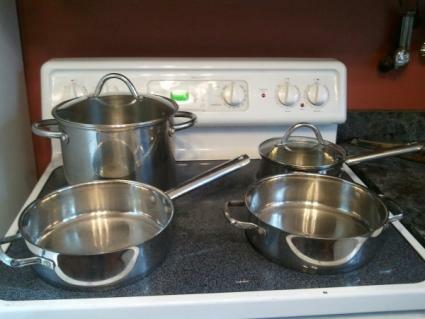 I purchased a set of Wolfgang Puck's 18-10 stainless Cafe Collection cookware from my local Sam's Club warehouse store as soon as I moved into a temporary home after the fire because, as I thought at the time, it was a fast and easy solution to "get by" until I got situated. While I did go on to purchase another set of cookware like the one I lost in the fire, the pieces that I still use most regularly - and prefer - more than ten years later, are the ones from the Wolfgang Puck set that cost less than $100 to purchase. This line of cookware is made from a very durable, sturdy stainless steel with encapsulated aluminum bases that stand up to a lot of wear and tear. When I bought this cookware, durability wasn't my primary concern, but I have been very impressed with its longevity. Several Amazon.com reviews indicate that I'm not the only person who feels this way. One reviewer goes so far as to say that he didn't expect much from cookware priced this low, but reports being highly impressed with its performance. A commenter on TheKitchn.com recommends it to a poster looking for cookware recommendations, stating that a set she's owned for a long time "seems to be pretty much indestructible." As with most stainless cookware, each pan is oven-safe up to 400 degrees F, and the lids are heat proof up to 350 degrees F. They are also safe for induction stovetops, which is what I use mine on most of the time. I have baked in my pieces a few times in a 350 degree oven with no problems. While I hand-wash my stainless steel pots and pans most of the time, I have used the dishwasher with the smaller pieces a few times with no problems. It's not just the pots and pans that are durable. The lids are made of tempered glass, and heat treated to make them more durable as well. This is the only cookware set I've had with glass lids, and was somewhat skeptical about them initially. However, I still have all of the original lids that came with the set I purchased in 2002. They have held up well through continual, and not always gentle, use and storing over a long period of time. I love the benefit of being able to see through the lid during cooking. This keeps me from having to remove the lid during cooking, something that saves times and leads to better-prepared dishes and more precise cooking times since the steam doesn't have to be let out several times during simmering. A few of the pieces in my set have a non-stick coating, but I do not have the full nonstick set. Based on my past experience with other brands, I did not expect the coating to hold up to regular use, but was pleasantly surprised to be proven wrong. I am careful only to use nylon spatulas and spoons when using the nonstick items, and have not had any problems with discoloration or chipping beyond what could only be considered normal with years of repeated use. I have found the performance of the nonstick surface to be excellent. I have never experienced any food items sticking to it, a sentiment echoed by a consumer review published on Viewpoints.com. Online reviews for the full non-stick set are not as positive as what I experienced with the set I purchased from Sam's Club. A review of a few different brands at Yahoo! Voices indicates that the 12" nonstick omelet pan, a piece that I do not own, tends to lose it's nonstick properties over time and that flaking and peeling tend to occur. Some Macy's and Amazon reviewers have also reported problems with flaking of the nonstick coating for the full nonstick set, which is different from the one I have, and a Best Buy review reports that the nonstick surface is ineffective. I have handled these pieces in stores, and they do not seem quite as well-made as the pieces I own. One of the most important aspects of any cookware is its ability to heat uniformly and evenly throughout. There are many ways to achieve this capability, but Puck has chosen to craft his cookware with an inner core of aluminum, which is a great conductor of heat. In fact, it conducts heat better than stainless steel, but stainless steel is a much more durable material. So, you have a win-win situation with an aluminum core that heats up more quickly and more evenly than a simple stainless steel core. I prepare stir-frys frequently, as well as a number of other dishes that require a pre-heated pan, tasks made faster thanks to the quick-heating properties of this cookware. Many cooks have experienced the uncomfortable moment when a bare hand hits the steel handle on a pot or pan, and the inevitable burn that follows. The Puck collection helps home cooks avoid this situation with hollow, comfort-grip, double-riveted stainless steel handles which are cooler to the touch than other types of metal handles, something I have observed - and benefited from - multiple times. They also make the pans a little lighter to pick up and carry than other cookware. While my experiences with this brand of cookware set have been quite positive, it seems that the experiences of those who have purchased the currently available non-stick line have not been as positive. I can highly recommend the sets and pieces that are not designed to be nonstick. Sam's Club seems to have the lowest-price set, at just under $100 for 18 pieces. Amazon offers an 18-piece set for just under $120. If, however, you are shopping for nonstick cookware, based on reviews posted about the current product line, you may want to try a single piece before investing in an entire set. Bed Bath and Beyond carries a 12" multi-pan for about $40. If you're looking for affordable stainless steel cookware, Wolfgang Puck's collection is a brand that you should certainly consider. While the current nonstick sets might not be among the best available, my experience is that this cookware is a terrific bargain overall. If you want stainless steel pots and pans that will stand up to repeated use, chances are that you'll be very satisfied with this brand.